Facebook dropped $19 billion on WhatsApp, Snapchat is valued at $15 billion, and even the anonymous messaging app Yik Yak, despite being a little over a year old, is already valued between $300 million and $400 million. Messaging apps are big business, and here’s why. Based on new data from mobile analytics firm Flurry charted for us by BI Intelligence, messaging apps retained nearly six times as many users they attracted in their first months compared to the average user retention across all applications. 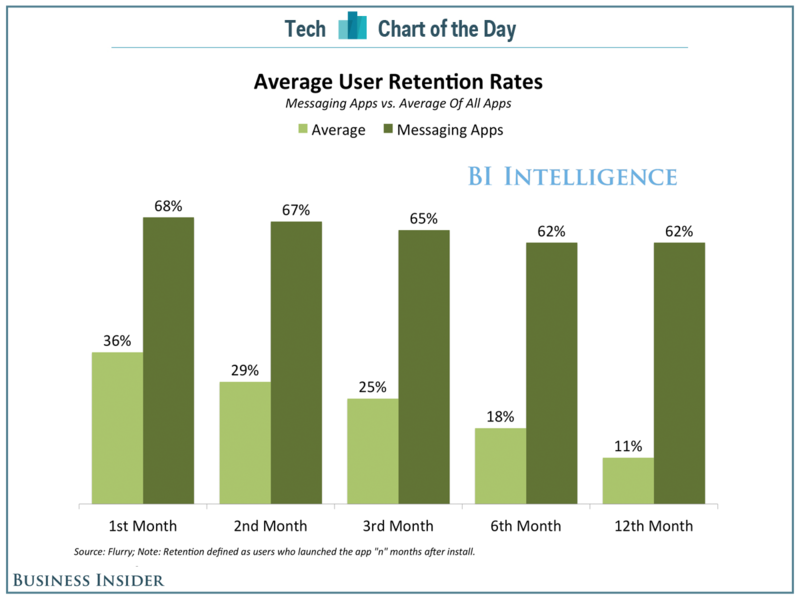 The average retention rate for all apps was 32% in the first month, and fell to 11% by the 12th month. In contrast, messaging apps held onto 68% of their new users after the first month, and slipped just a little bit, down to 62%, by the 12th month. But that’s not all: According to BI Intelligence, people also use messaging apps more frequently and for longer periods of time, too. Despite a soaring global economy, Prada, Gucci, and LVMH all seem to be stumbling, with revenues flat or in decline. Stagnation in the business of luxury goods is a surprise: Both the US and Europe are experiencing decent economic growth. China’s economy is still growing at 7% a year. When times are good, people ought to be splashing out on high-priced handbags and premium labels. But they’re not. Prada, LVMH Moët Hennessy Louis Vuitton, and Gucci are hurting. Prada is suffering the most. Digital ad spending worldwide will reach $170.85 billion in 2015, according to new estimates from eMarketer, and for the first time we’ve broken out global search ad spending figures. This year, search ads will account for $81.59 billion worldwide, an increase of 16.2% over 2014. By 2019, search ad spending will reach $130.58 billion globally, still growing at nearly 10% year over year. Google is still by far the dominant player in search, and we estimate the company will see 15.7% search ad revenue growth this year, increasing to $44.46 billion worldwide. That figure would account for 54.5% share in 2015. Meanwhile, Baidu is reaping the benefits of Google’s ban in China—and of course, a massive and growing internet user population—increasing its share to 8.8% of search ad spending globally this year, up from 7.6% in 2014. Baidu’s market share is a testament to the growth and influence of China’s digital ad market on the global stage. Search advertising spending in China will total $14.90 billion this year, up 32.8% from 2014, which accounts for 18.2% of all search spending worldwide. By comparison, the US search ad market will reach $25.66 billion this year. Anyone with a spare dollar can buy access to stolen, active Uber account information. Vendors on the new darknet market AlphaBay are peddling Uber user details. Google should worry a little more about Facebook, especially now since the company introduced its own media player that can be shared and embedded on different websites, just like YouTube. But, YouTube has one key advantage over Facebook and other user-generated video sites like Vine: A healthy balance of creators. 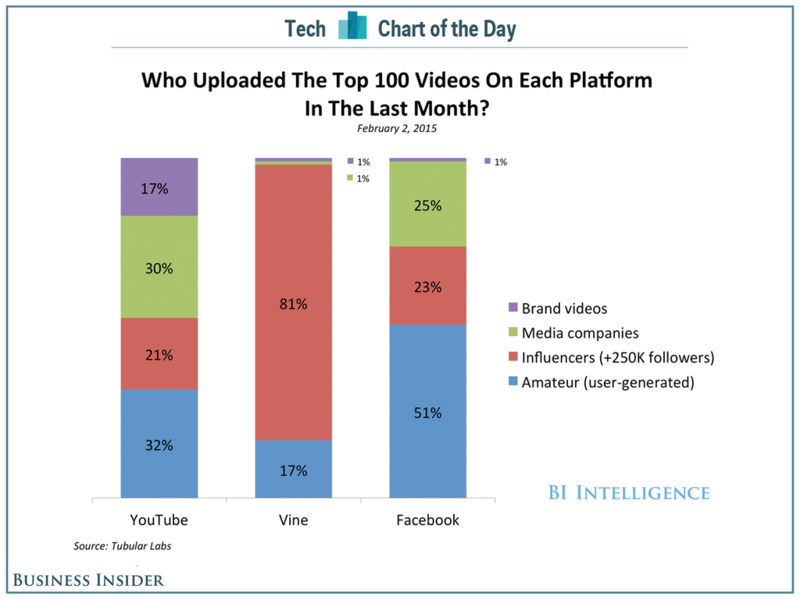 Based on recent data from Tubular charted for us by BI Intelligence, Facebook in January had a greater percentage of popular user-generated videos compared to YouTube, but YouTube has a pretty even distribution between amateurs, influencers, brands and media companies, so the company isn’t too reliant on any one particular group of uploaders. Compare that to Twitter’s Vine platform for 6-second videos, where the most influential users are in near-complete control of the platform’s popularity. Apple’s on top of the world right now, with strong sales across all its product lines — save for the iPad. Sales of the iPad have hit a wall, and while lots of people have different theories as to why that’s the case, Credit Suisse analyst Kulbinder Garcha believes there’s a simple answer: Large phones are to blame. Based on data from IDC charted for us by Credit Suisse and BI Intelligence, sales of large-screened smartphones (a.k.a. 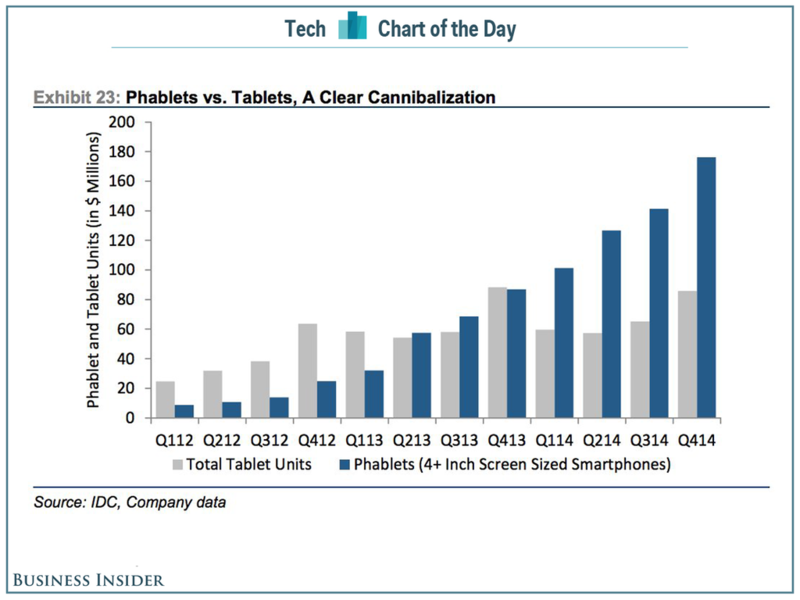 “phablets”) have been growing consistently while tablet sales have been slipping over the last year. After all, why would you buy an iPad when you can buy a big phone that does everything the tablet does, and more? If you’ve ever been saved from visiting a virus-laden website by Chrome’s malware-blocking technology, we have good news: You can expect to see this safeguard in other apps, too. Google has added tools for spotting “unwanted software” to its Safe Browsing developer kit, so any program can stop rogue web downloads. It’ll take a while before you see this show up elsewhere, but don’t be surprised if future apps with built-in web viewers are smart enough to raise a red flag. 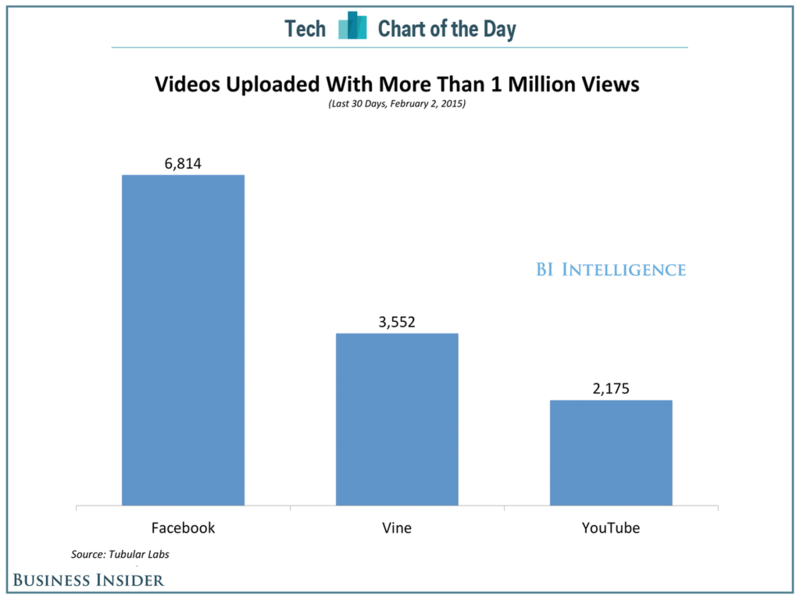 Despite the massive library of content on Google’s YouTube service, Facebook was able to claim more videos with more than 1 million views in the last 30 days, according to data from Tubular Labs charted for us by BI Intelligence. This is a pretty impressive feat considering YouTube’s search functionality is far ahead of Facebook’s, and YouTube also offers fewer restrictions and more opportunities to make money through ads. Yet, Facebook is becoming a more attractive place for people to upload their videos. Between auto-play and the lack of pre-roll ads, Facebook videos are getting lots of engagement: New data suggests more videos have been uploaded directly to Facebook than shared on the site via YouTube, which is pretty impressive, and the company on Wednesday announced a new video player that should improve engagement by letting any website embed its new video player, just like YouTube’s. Next year will be the tipping point where mobile ad spending surpasses desktop. And while desktop advertising will remain a significant portion of marketers’ budgets—approximately $25 billion in each year throughout eMarketer’s forecast period—mobile will continue growing in the double digits to gain more and more market share while desktop s! pending remains flat. As with years past, the average tenure of a CMO differs widely across industries, highest among those in the technology industry (65 months) and lowest among those in the automotive sector (26 months). The largest year-over-year percentage change was observed for CMOs in the communications/media (+30% to 44 months) and healthcare (+23% to 52 months) industries. By contrast, the average tenure for a CMO in the retail/apparel industry shrunk by 25%, to 40 months.